Sometimes, on courses or at workshops, as an ice-breaker you’re asked to say something interesting about yourself. It’s a cruel torture for introverts like myself. My line, which is really about someone else, is that my grandfather was born one-hundred and one years before me, in 1864, around the time of the burning of Atlanta. In genealogy terms it’s a big head-start, two generations and I’m all the way back in the mid-Victorian era. An off-shoot of all this, an important one to me, is my half-uncle, another Richard Buxton, was killed in the first world war. Richard was killed fighting the Austrians in northern Italy in June 1918 and was by then twenty-nine. He was a captain in the Oxford and Bucks Light Infantry and had only come to Italy a few months earlier, after two years in France. Being named for him by my father (who arrived eleven years after Richard was killed) I had some sort of connection. After my divorce in 1997 I guess I was in an extended crisis, needing new attachments where I could find them, even from long dead uncles, so I travelled to Italy to find the grave. 2018 is the hundredth anniversary of his death and I’d long promised my family that we would holiday on Lake Garda, a couple of hours away, and drive up into the hills to pay our respects. I think my wife, my teenage daughter, my two elder daughters and their partners were all struck as I was on my first visit. The cemetery really does have a sense of peace about it. 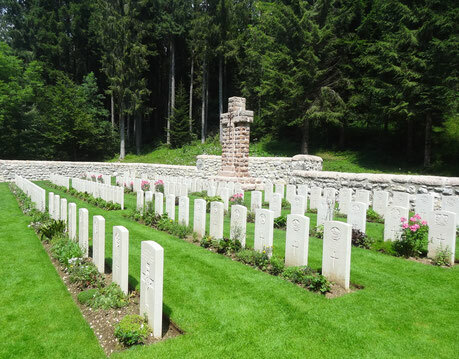 Managed by the Commonwealth War Graves Commission, it’s small: One hindred and sixty-six servicemen are buried or commemorated, tucked into a wooded vale in the pine forests of the Asiago plateau. Four neat rows of graves are surrounded by a thick wall and backed by a heavy cross of some pinkish rock. It’s well tended. The gate is heavy but swings open quietly, no squeak to disturb the silence. There’s a visitor’s book. Each grave, at least those with names, has carved into its white stone the emblem of the soldier’s regiment. We posed for pictures outside the gate, each of us struggling to know what expression was appropriate. It’s not really a holiday snap, but we never knew the man we’d come to honour. Richard was one of the older soldiers. What I found myself thinking and taking about with my daughters was choice. How little of it there would have been given the forces that governed that time. Today, we live in a country swamped by choice, so much so we find it hard to imagine a time without it. There’s often too much, choosing becomes more akin to problem solving. For this trip we had to choose a villa. Not really a chore, I know. We had to decide on an airline, a flight, an airline seat. I spent forever deciding on the right car which they didn’t have when I got there anyway. Even away from holidays we live in a daily whirl of choice that is presented as a good thing. I have my doubts. Too many choices frustrate me. In that peaceful place I could step back and see the meaningful choices I’d been allowed to make since my visit twenty-one years before. I’d chosen a partner and, more importantly, she’d chosen me. I’d helped to bring up two daughters and was lucky enough to have a third. I’d moved from job to job, gone back to university, even found enough space in my life to write stories and a novel. What luxury. For Richard there was a short time for choices before the war. He trained as a teacher and did some part-time soldiering. He joined up fully in September 1914 as a corporal and married the following summer. His battalion was part of the Home Guard, not obligated to fight overseas, but when conscription was bought in later in the war they changed all that. Everyone was obliged now. He fought in a diversionary battle on the edge of the Somme. His battalion suffered greatly. They fought again at Ypres. I’ve no idea how often he got home. Late in 1917 they were moved to Italy, a quiet front, until June 15th 1918. Early, the Austrians fired shells and gas into the thin British line and attacked at 7am. Richard’s company was virtually surrounded. He had a choice that day. He volunteered to go and bring up re-enforcements. He was shot but his servant bound him up and they went on. The next bullet killed him. The line was restored the next day. I think Richard would have swapped our world for his in a heartbeat. He would have been brave enough to cope with my endless choices. 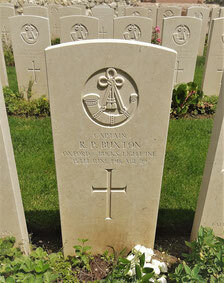 We had three cap-badges that were his, the same design as the carving on his stone. I’d brought one to Italy. My family behind me, I knelt down and pressed his badge into the damp earth of his grave. Oh goodness, this has finished me off today. A beautiful piece of writing, Richard. Thank you for sharing your uncle and his life with us. Another lovely piece of writing Richard.